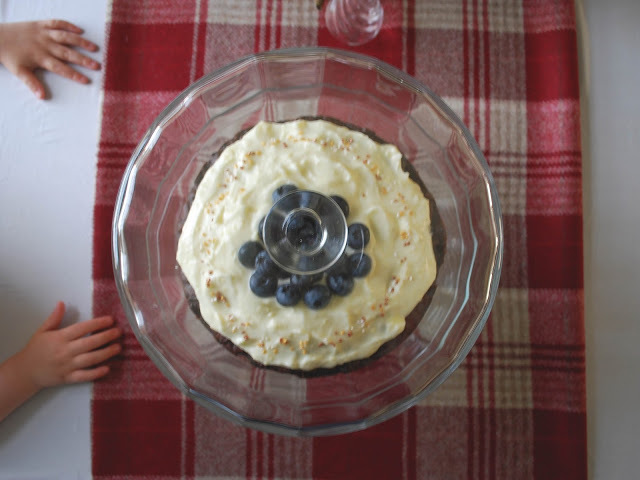 Carrot cake is a favourite in our house, as I’m sure it is in countless other homes throughout the country, but sometimes it’s fun to mix it up a little. I stumbled across an idea for a chocolate carrot cake whilst browsing for autumnal cakes a few weeks back and thought I’d try to make my own take on it. 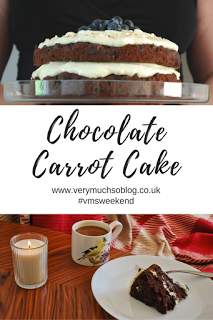 I really enjoyed it and the cake disappeared pretty quickly so it’s safe to say it was a hit in our house so I thought I’d share the recipe for this week’s ‘Something for the Weekend‘. I’ve italicised any directions that it would be fun for a child to help with in case your child is anything like Lyra who loves to be in the kitchen. Cream together the butter and sugar until light and fluffy and then add the eggs one at a time, beating well. I used the electric whisk here which Lyra is scared of but she enjoys cracking the eggs into the bowl. Sift the flour, cocoa powder, baking powder and bicarbonate of soda into a separate bowl with a pinch of salt. Sifting is always fun for little ones if slightly messy when they get over enthusiastic! Mix two thirds of the flour mixture into the egg mixture until just combined. Bake for 25 – 30 mins checking that a skewer poked into the middle comes out clean. Once the cakes are cool make the frosting by whisking together the Philadelphia, icing sugar and butter Electric whisk again so Lyra was nowhere to be seen but if your child wasn’t scared this could be a good chance for them to join in. Spread half of the frosting over one of the cakes and then place the other one on top. 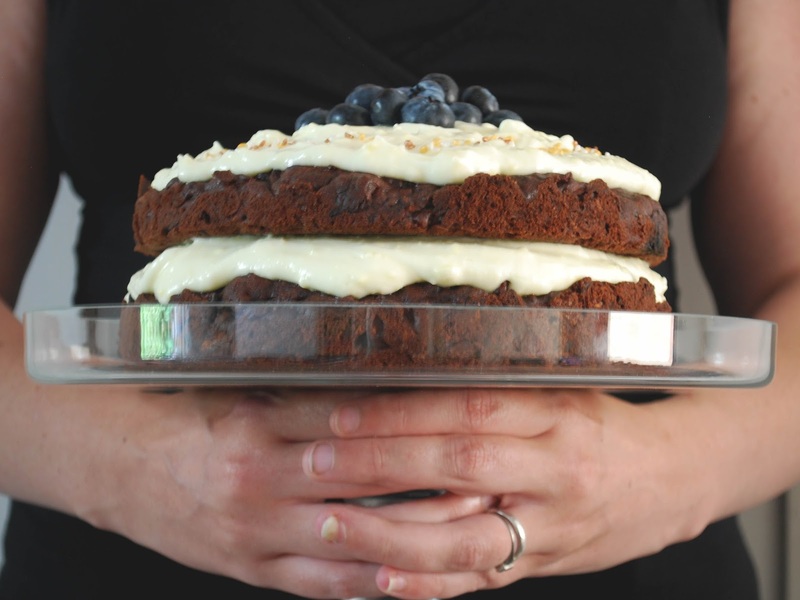 Finish the top of the cake with the rest of the frosting and blueberries. Lyra loves the decorating stage although a lot of blueberries were eaten during the process! So there we have it. What do you think? If you want to add more chocolate to the recipe you can add 150g chopped chocolate to the carrot and flour mixture but I thought the cocoa powder added enough chocolate for me. 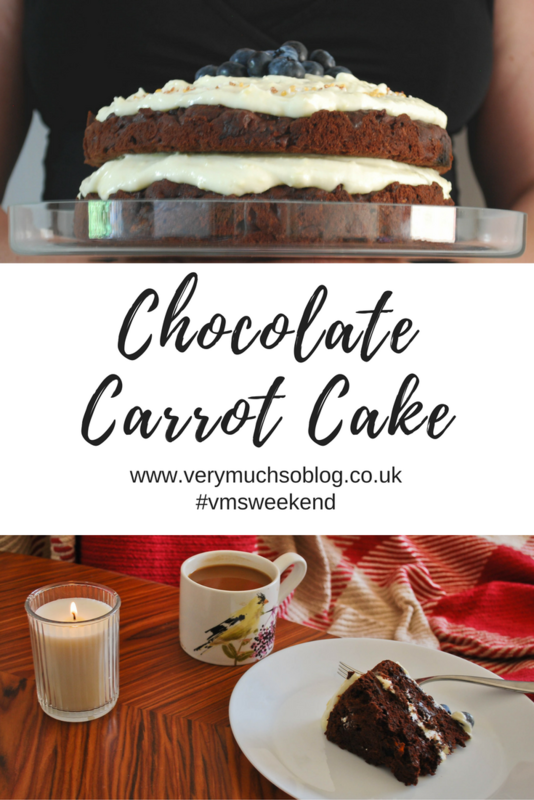 If you try this recipe please tag me on Instagram or Twitter or use the hashtag #vmsweekend because I’d love to see your creations!